Secretary of state: U.S. has "absolute commitment to Israel's security"
Israeli ambassador had said earlier in week that relations were "in a crisis"
Washington (CNN) -- Secretary of State Hillary Clinton is dismissive of the view that relations between the United States and Israel are in crisis after a row between the two countries over settlements. Clinton acknowledged the United States expressed its "dismay and disappointment" after Israel's announcement that it will allow construction of 1,600 settler housing units in East Jerusalem. 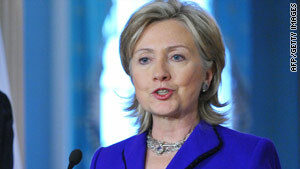 Secretary of State Hillary Clinton said the bond between the United States and Israel is "unshakable." She said U.S. and Israeli officials are in intense talks "over steps that we think would demonstrate the requisite commitment to this process," and the United States is waiting for a response from Israel on steps it is willing to take. She did not say when or how that response would be conveyed. "We'll see what the next days hold," Clinton said. "There's just too much at stake for the Palestinians and the Israelis. ... Our goal now is to make sure that we have the full commitment from both our Palestinian and Israeli partners to this effort." The lack of an immediate response, however, has contributed in part to a delay of proximity talks to be led by former Sen. George Mitchell, the Obama administration's special envoy to the Middle East. Mitchell was originally scheduled to leave Sunday for talks in the region Tuesday, but his departure was postponed to await the Israeli response. State Department spokesman P.J. Crowley said Tuesday that due to "logistics" the trip will now take place after Mitchell participates in previously scheduled meetings Thursday and Friday in Moscow with the Mideast Quartet -- four international entities seeking peace in the Middle East. "There's simply not enough time to have meaningful discussions with the parties Wednesday in order to be in Moscow for the quartet meeting Thursday," he said. Crowley did not give a specific date for the rescheduled talks. The United States has asked Israel to "do something significant" to show that it is serious about moving toward negotiations with Palestinians, a U.S. official and an Israeli official told CNN on Monday. Specifically, the United States asked Israel to rescind the decision on the settlement project, the sources said. Clinton also told Israeli Prime Minister Benjamin Netanyahu the United States wants Israel to issue an official declaration that talks with the Palestinians, even indirect talks, would deal with all the conflict's core issues, including borders, refugees, Jerusalem and settlements, the sources said. The importance of making progress in Palestinian-Israeli talks was underscored Tuesday by Gen. David Petraeus, who oversees U.S. military operations in the Middle East. In remarks prepared for the Senate Armed Services Committee, he said there has been "insufficient progress" toward peace. "The conflict foments anti-American sentiment due to a perception of U.S. favoritism for Israel," Petraeus said in the prepared remarks. "Arab anger over the Palestinian question limits the strength and depth of U.S. partnerships with governments and peoples." Also Tuesday, U.N. Secretary-General Ban Ki-moon said the United Nations is "deeply concerned over developments on the ground" and added that it condemns the plan for new housing units. Ban called for "restraint and calm by all." And Daniel Kurtzer, a former U.S. ambassador to Israel who advised President Barack Obama on Mideast policy during the 2008 campaign, said he thinks U.S.-Israeli relations are "a very serious problem, not because of the proximate issue of the particular housing in Jerusalem, but because we've had over a year now of misunderstandings, miscommunications, expectations that have not been met on the part of both the administration and the Netanyahu government, and they now come to a head at a particularly bad time." "The most immediate step now is for Prime Minister Netanyahu to respond positively to the steps that Secretary of State Clinton asked for," Kurtzer said. That, he added, would allow Mitchell "to get the proximity talks started. And I think the faster those talks can get started, the more opportunities there will be to work through some of these misunderstandings." CNN's Elise Labott and CNN Radio's Steve Kastenbaum contributed to this report.